Yay for our first gift guide of the season!! I’m excited to do these again this year because I know a lot of you really loved it last year. 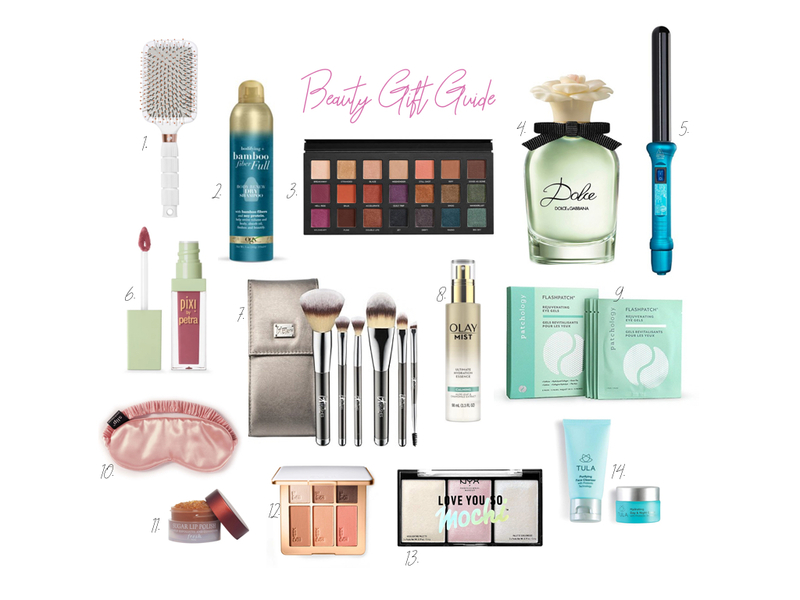 I love to get my shopping done early and I know I can’t be alone so I’ve put together some of my favorite beauty products here that are PERFECT gifts and would be so cute to add to someone’s stocking too. All of these products I have tried myself and swear by. These are the best of the best and I know your loved ones will love them too. Here we go! 1. T3 Paddle Brush – I love using paddle brushes because they massage my scalp and get my tangles out easily! 2. OGX Dry Shampoo – A super affordable dry shampoo option that also comes in travel sizes for stockings! 3. Urban Decay Eyeshadow Palette – This is my favorite eyeshadow right now! The colors are very pigmented and I have so much fun playing around with all of them! 4. Dolce & Gabanna Perfume – A high end perfume always makes for a great gift for the beauty lover! 5. NuMe Curling Wand – I use my NuMe curling wand all the time and my curls last for days. This is worth the money! 6. 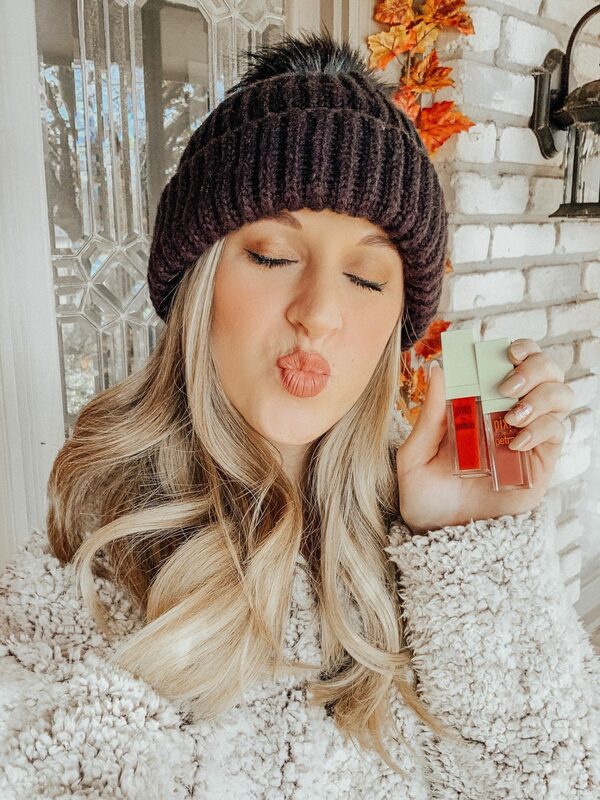 Pixi Liquid Lipstick – I’ve been loving these Pixi lipsticks because they last all day and comes in a ton of pretty colors! 7. It Makeup Brushes – The softest makeup brushes you’ll ever feel! I’ve had mine for almost 3 years and it’s still extremely soft. 8. Olay Facial Mist – I recently tried this product and have surprisingly been using it nonstop! It’s the perfect pick me up especially if you have dry skin in the winter. 9. Patchology Eye Gels – If you’ve been following me on Instagram, you know I love Patchology products and these make for a great stocking stuffer! 10. Silk Eye Mask – These are so fun to stuff in a stocking and they’re also great if your loved one has eyelash extensions! 11. Fresh Sugar Lip Scrub – I first tried this product in New York and to this day it is still my favorite lip scrub to use. It feels so amazing on your lips and leaves them feeling extra soft and smooth! 12. Ever Makeup Palette – This palette is my holy grail. must-have makeup palette right now. It has eyeshadow, bronzer, highlighter AND blush all in one and the colors are perfect for when I’m going for a glowing, natural look. 13. NYX Highlighter – My favorite highlighter to date! A little goes a long way and you can find this at the drugstore! 14. Tula Cleanser & Eye Cream – Everyone raves about this skincare line and I’m right there with them. This is a quality product that so many people love. My favorites are the cleanser and the mask!